Entenmann's: The Perfect Choice For Holiday Entertaining! Great New Recipes! You are here: Home / Sponsored / Entenmann’s: The Perfect Choice For Holiday Entertaining! Great New Recipes! Entenmann’s: The Perfect Choice For Holiday Entertaining! Great New Recipes! Entenmann’s sent me the best gift! Some FREE product coupons and a box of Entenmann’s K-Cups! Did you know they make coffee, too?! If you love Entenmann’s you have to try their coffee! Who doesn’t love a sweet treat now and then? But, you know what Entenmann’s would be great for at this time of year? They are great for any get-togethers you might be planning, everyone loves sweets during the holidays! Entenmann’s also has great recipes for you to try that your guests and your family are sure to love! It may be the most wonderful time of the year, but at times, it can also feel like the most stressful. Holiday season can make everyone a little crazy. Between shopping, entertaining, holiday parties and every day life, schedules are constantly booked and families are always running around. Using already prepared foods is one of the simplest (yet yummy) ways to create holiday bakery delights. This season, Kathleen Robbins, head baker at Entenmann’s and Sara Lee Snacks, is introducing half way to the holiday’s recipes, which are easy to make and save time during all of the holiday madness. Founded in 1898, Entenmann’s bakery has over 100 sweet baked goods, including a wide variety of delicious donuts. The Entenmann’s Dreamy Chocolate Bars feature the Entenmann’s classic Rich Frosted Donut. This cake-style donut is drenched in rich, wonderfully smooth chocolate. Bite into one, hear the crack of the Rich Frosted shell and enjoy the soft yellow cake interior. Baked into a delicious chocolate bar, the Entenmann’s Rich Frosted donut is mixed together with flaked coconut, caramel popcorn and a few other ingredients, guaranteed to be a delicious delight your family will enjoy. Double the batch and have an extra on hand for the perfect hostess gift. Check out the recipe here! The Entenmann’s name has stood for the finest quality in baked goods and that same commitment extends to the Entenmann’s single serve coffee selections. Working with the finest coffee growers around the world, selecting only 100% Arabica beans and roasting them into small batches ensures consistent quality coffee with every roast. Packaged immediately after roasting to lock in freshness, Entenmann’s coffee cups, available in classic and dessert flavors, are great for Holiday entertaining and were created to be the perfect complement to Entenmann’s baked foods or savored on their own any time of day. Sara Lee, the iconic American brand, delivers a new way to snack with fresh baked, individually wrapped snack cakes. Do you love brownies? How about chocolate chip cookies? 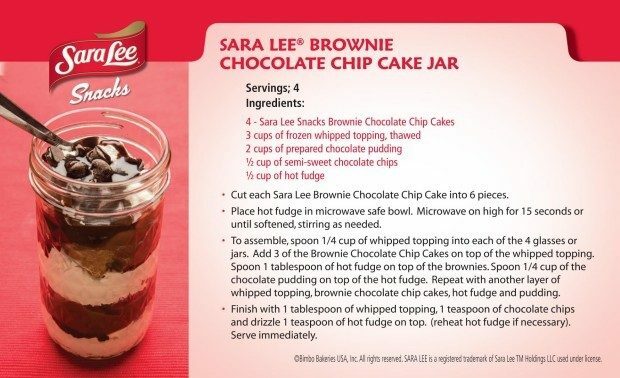 If you said yes to either, then the Sara Lee Snacks Brownie Chocolate Chip cakes are perfect for you! With rich fudge brownies and sweet chocolate chips, this cake was made to please all chocoholics! 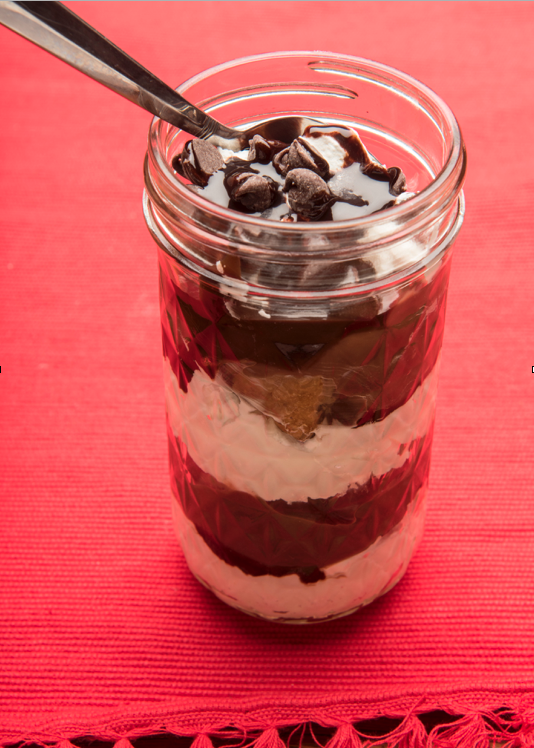 The Sara Lee Snacks Brownie Chocolate Chip Cake Jar features the Brownie Chocolate Chip cakes, put together with whipped cream, chocolate pudding and hot fudge. This easy “how-to” is the perfect treat for home and will be a hit for all of those holiday parties! 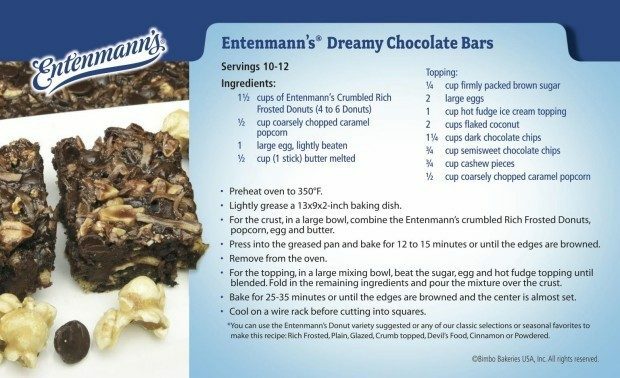 For more info and more recipes, check out Entenmanns.com.